Reznor® Model Series RPBL is factory-designed assembly of one, two, or three duct furnace(s) and a large-capacity blower cabinet and a variety of control options for heating, makeup air or a combination of these functions. Pre-engineered design allows for single unit installation, provides unified appearance, and saves customer engineering time and assembly costs. 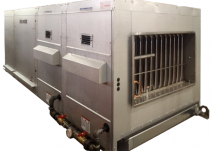 Models are available for outdoor use in heating capacities from 400,000 through 1,200,000 BTUH gas in-put. Model RPBL systems are available for use with either natural or propane gas, as specified. Each unit is equipped with all required limit safety controls. Controls and wiring are accessible through lift-away side panels. Model RPBL systems are completely weather sealed. No additional protective covering is required. Each packaged unit is designed for installation on a full roof curb or field supplied supports. RPBL units feature an integral power vented system for use where environmental conditions pose a problem for gravity-vented units. NOTE 1: Regulated combination redundant gas valve consists of combination pilot solenoid valve, electric gas valve, pilot filter, pressure regulator, pilot shut-off, and manual shut-off, all in one body. Gas supply pressure must not exceed 0.5 PSI (8 oz. – 14” W.C.). Minimum inlet pressure for natural gas is 5” W.C. Minimum inlet pressure for propane gas is 11” W.C. NOTE 2: Not certified for residential use.